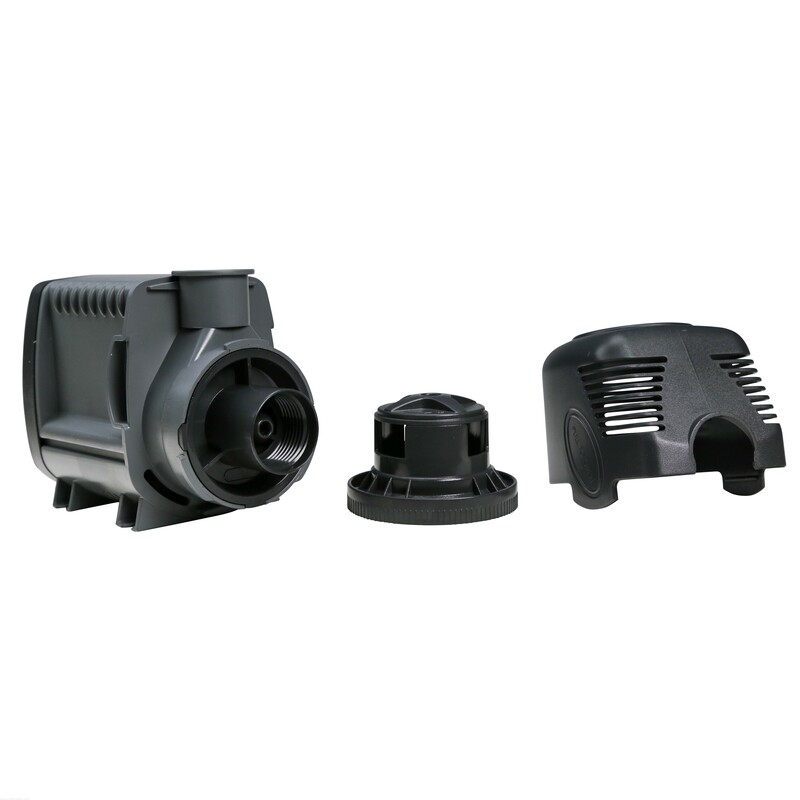 Quiet, energy-efficient pump for a variety of uses in a wet or dry application. Use in salt or freshwater. This is an extended time review. This pump has been in operation 24/7 for 2 years now and its still going. Guess it depends on your definition of silent! I plugged it in and thought it was dead because I could not hear it. I had to get up and look at my outlets to see that they were in fact pushing water! Now I do have the rubber feet installed and I have it sitting on top of a thin piece of rubber and keep it from touching the sides of my sump. No buzzing or anything. I have it shutting off twice daily for feedings and it just runs like a top! My apex says it is only using 57Watts which is about half of what it is rated for....almost half of what my mag 9.5 is using on my skimmer. I have this unit on my return with it running at full capacity. It gives off a decent amount of noise and vibration. When it is turned down to the minimum level there is a big difference in noise and vibration in a good way. It does the job and has been running great for almost six months with no issue. Purchased for a new build based on BRS recommendation. Only four stars because it is not installed yet but out of the box it appears to be built well with maintenance in mind. Bought it thinking it would be quiet but my old dc pump is much quieter. I'm going to switch it back and sale this one on CL. 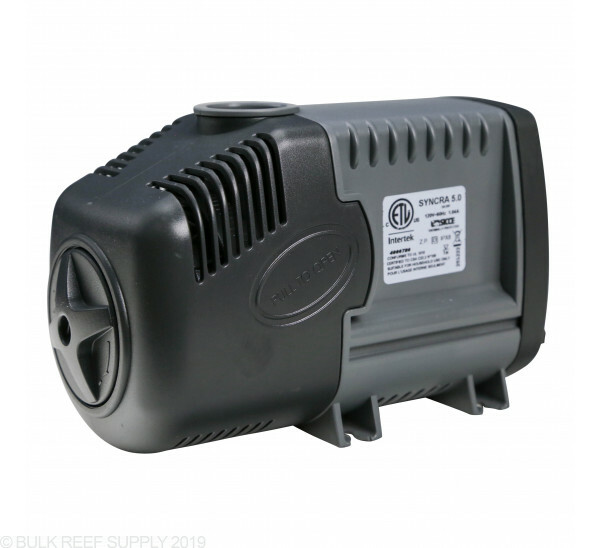 This pump works great on my 80 gallon as the return pump. I love the adjustable flow rate. Silent to me means, can't be heard. In my EShops R100 Sump vibrations do create some noise. So for false advertisements I give it 3 stars. Further more they have since come out with the Pro Line (that will not fit in my sump) that is advertised as quieter than this.... How can you release a pump quieter than silent? I still recommend the pump, but is it Quiet, not silent! Powerful pump and very quiet. I put it on some food safe silicone mat and made it even more silent. Great product! I've had this running for 6 months now and it works great and is totally silent as the name suggests. It is also adjustable. I originally had a DC10500 pump in my Sump, but it died in less than 3 months! I luckily had this pump available because I was using it for water changes. Well let's just say that this pump can perform as or better than advertised! My sump is in the basement and my reef tank is on 1st floor , so roughly 8 ft of head, plus a check valve and ball valve shutoff. No worries, it just keeps trucking! Silent is in the name for a reason, very little noise. I'm building a 110g vs a 90g reef with 35g sump. Head ht would be about 60in vs 54in depending on which size I go with. Would this pump be sufficient? 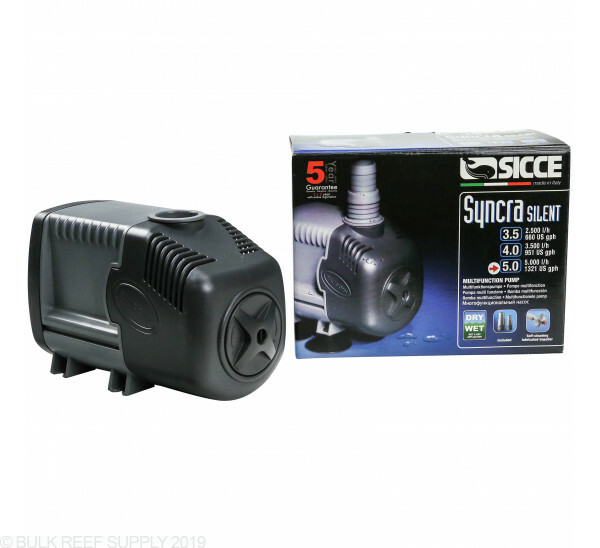 We have personally used the Sicce 5.0 on a 110 gallon with great success! Feel free to let us know if you have any further questions! I'm building an AIO compartment for my 45 gallon. It will be 11" x 5" x 12-16" (L x D x H). I calculate ill have 21" of linear flow into the box, which could handle approximately 1400 gph. Would this pump work for this? This pump would be slightly overkill for a 45 gallon tank. Typically for return pumps they are based on 10x your system volume so a pump around 450 GPH would work great without too much flow. Even while you have the option to run up to 1400 GPH you will not need to as it will only fill up as much as the return pump can push back into the display. Feel free to let us know if you have any further questions! Any inside on this, it looks like it is not easy to find these.. I have 1" pvc tubing coming out of my sump. Do you have what I would need to connect the outlet from this pump to that 1" pvc. The pump outlet is so much smaller than the pipe going out to the tank I cannot figure out what I need in order to connect the two. Thanks! 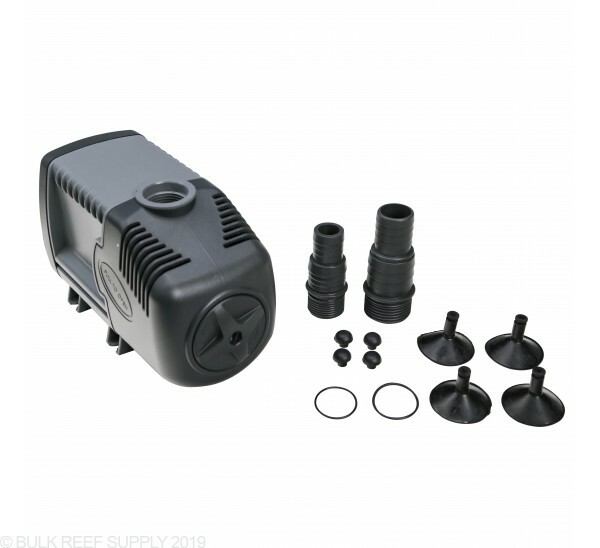 Would this pump work in the Red Sea Reefer XL 525? The recommended flow is 1060 gph. Can this be dialed down slightly or ok for output to be 1321 gph? The Sicce 5.0 would work perfect! Overall it would not need to be dialed down too much as the head pressure from returning the water to the top of the tank would account for the extra 300 GPH. Feel free to let us know if you have any further questions! If I have a 240 gallon Tank and a 40 Gallon Sump. With displacement I calculate to be around 245 gallons of water total. How would I get a pump to create 10x turn over without the water screaming through the sump? Don't you want the water to be a slower flow through the sump? Ultimately you will want your sump to be able to handle the flow that is being circulated through your display tank. If your sump is creating bubbles and splashing then the sump size should be increased or redesigned. Now, when you start talking about return rate with larger tanks, the 10x return rate becomes a loose suggestion since that is a ton of water flowing. Most people will decrease down to about 5x the display size for the return flow rate and then supplement with powerheads or a closed loop system. I am building a 120 gallon reef and have about 12' of head as the sump is in my basement and the tank is on the main level. 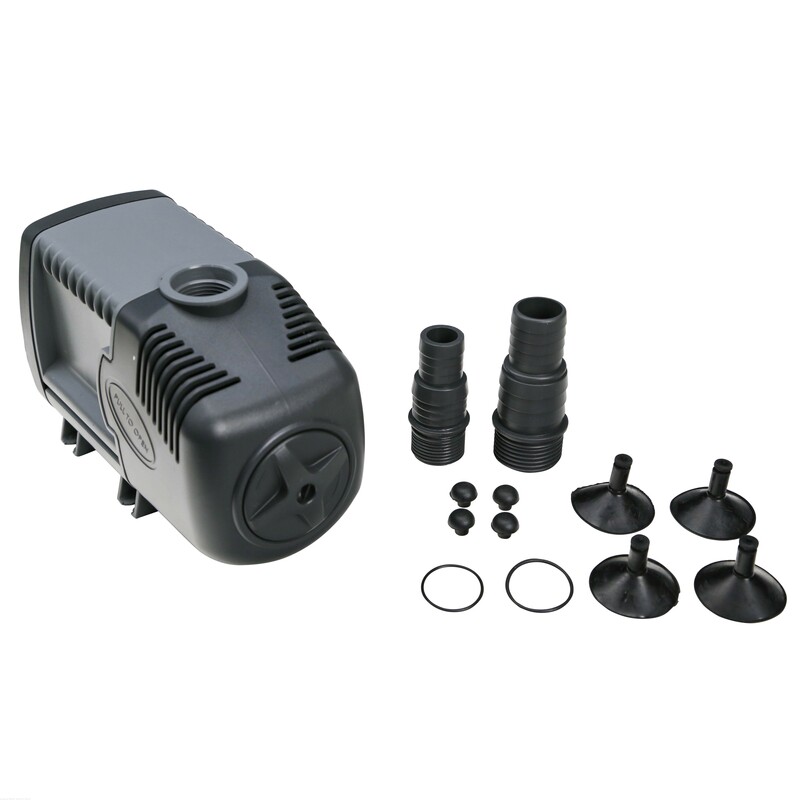 With a few 90 degree bends up to the tank what do you recommend for a pump? For a submersible pump the options are limited with a 12' head height down to our DC options. You can get by with the Vectra L1 by Ecotech and tubing down the flow as well as the Waveline 12000 as a great alternative. Feel free to let us know if you have any further questions! Looking to plumb somewhat of a manifold off my return pump that will feed 1. My 60 gallon display (about 4.5 ft head pressure), 2. A 40 gallon remote refugium with overflow draining back into the sump (around 4 ft of head), 3. A BRS dual reactor. All feeds will have a gate valve to fine tune flow. Is this pump a good match for my needs? Also, I haven't been able to find anywhere, but I see that the pump flow rate is adjustable, any idea what the low end of flow is for this pump? Will this pump.be sufficient to properly recirculate the tank using a trigger system 39 sump. Normally we will suggest anywhere between 5-10x the display tank volume for a flow rate through the sump and then up to the display. The head height of the tank above the water level in the sump will also become a variable in how much flow will actually make it up to the display tank. 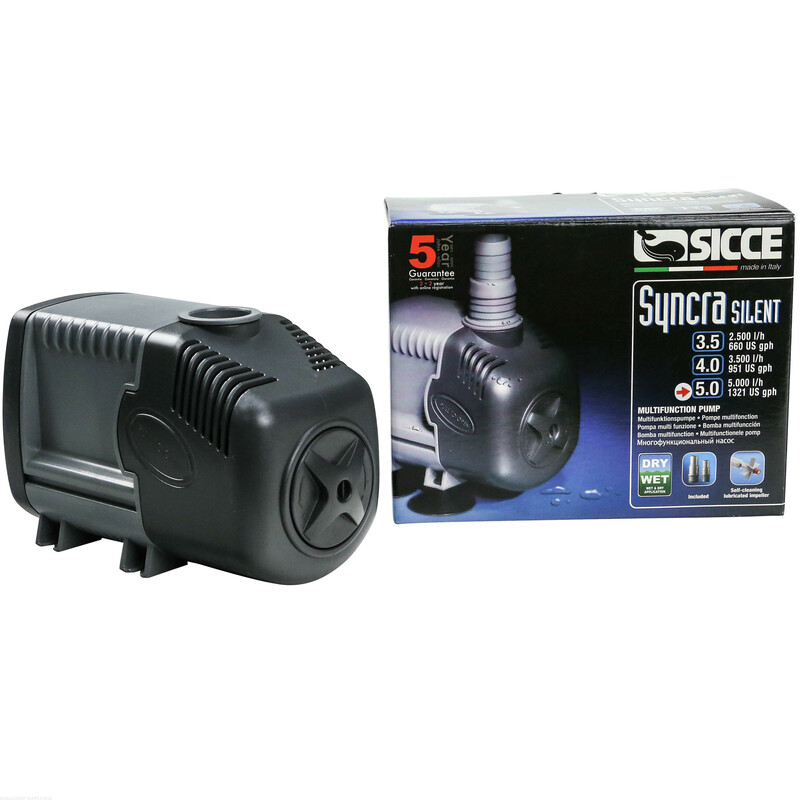 The Sicce 5.0 would get you on the very low end of the flow suggestion that we have. 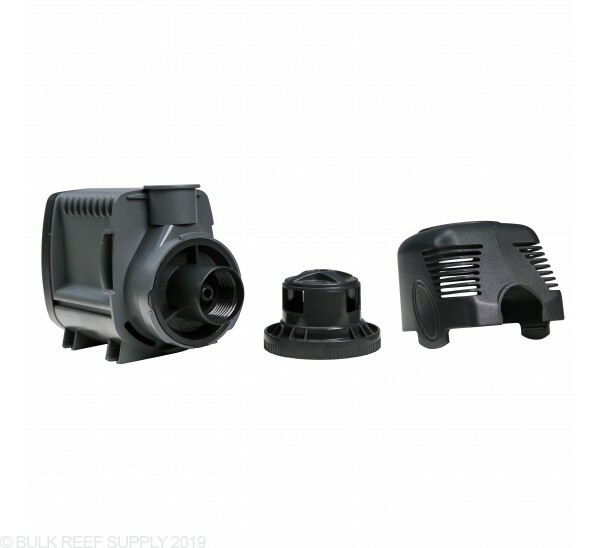 You may want to take a look at the Waveline DC10000II since it does have much more available flow, and being a DC pump you can fine tune it to the flow your tank and sump will handle.